While most homes these days are all about standard faucets, modern design is taking over with sleek curves, elegant edges and smart shapes. 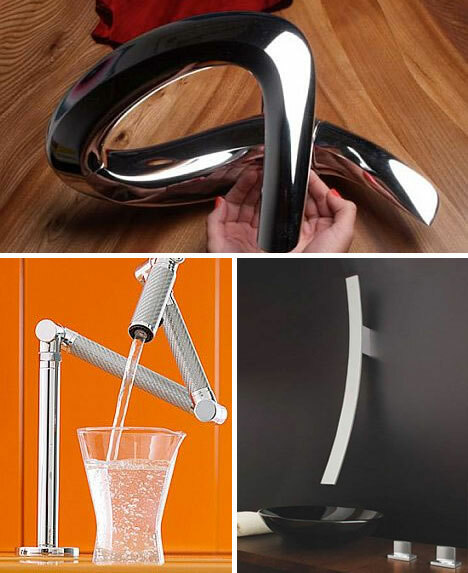 And since the future is all about interacting with water in the funniest, yet most stylish possible way, here is an amazing list with probably the best faucets you’ve ever seen so far. 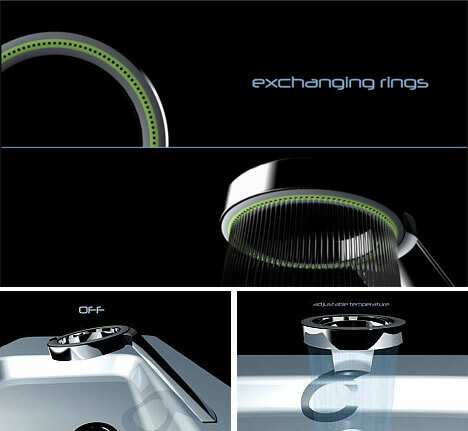 Edging away from the conventional, with his Ring Faucet, designer Sun Liang allows the water to flow in a circular fashion. And although it may not look that perfect after a few months worth of mineral deposits, the flatness of the design sure makes you think of the smoothness of a waterfall. Designed by Smith Newnam and the gang at Touch360 Studio, Ball Ripples is a really cool and modern bathroom faucet that combines a clean design with the purity of the water. 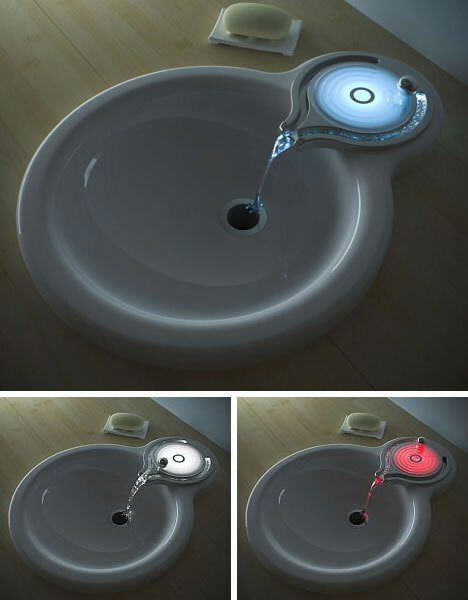 Fitted with an array of electromagnetic sensors, to control the faucet you maneuver an electronically-secured metal ball that will turn red or blue to tell you how hot the water is. 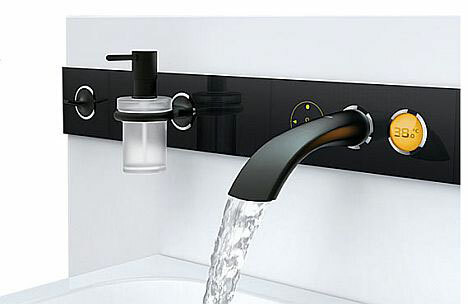 This is Ondus Digitecture, a sleek digital faucet by the Germans from Grohe. Renowned for their exclusive designs, Ondus has a slim wall mount panel with a touchpad control, digital temperature readout and handy holders for whatever you need. It looks like the KITT of faucets, but we’re a bit disappointed it doesn’t have a turbo boost button. Looks gorgeous! 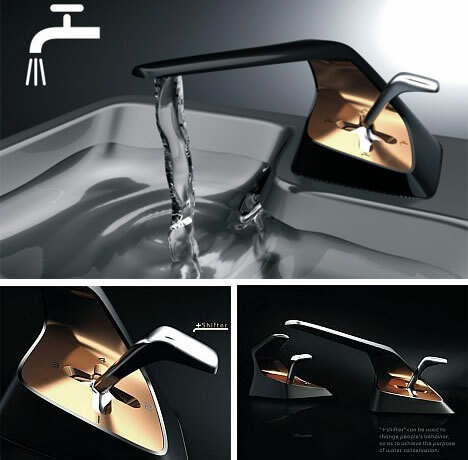 Former head of Mercedes Benz design, Burno Sacco teamed up with the wicked chaps at Octopus Design to create a luxurious faucet. Although totally different from designing cars, with its sheet of flowing water that mocks its edgy origination, the shining proves nothing short of cool. 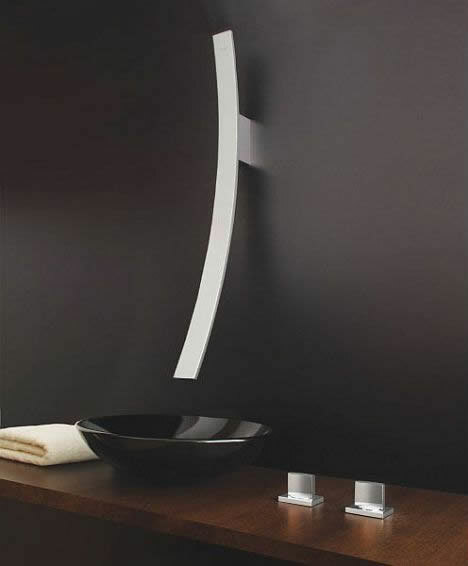 Designed for British manufacturer by renowned architect Zaha Hadid, this Triflow Tap is a seductive addition to any modern environment. Charting the fluid geometry of water in motion, the glossy tap boasts a patented three-way technology that sends filtered water through a dedicated waterway, separate from the hot and cold water streams. Designed by the Italians from Newform with a pretty traditional design, the X-Touch Mixer faucet does away with antiquated analog knobs and uses a bunch of buttons instead. 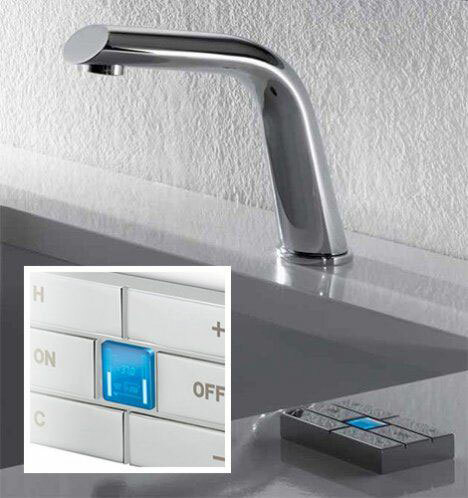 Buttons that help you set the temperature of the water to suit your needs. Precise and informative, obsessive compulsives will definitely love one of these in their showers. 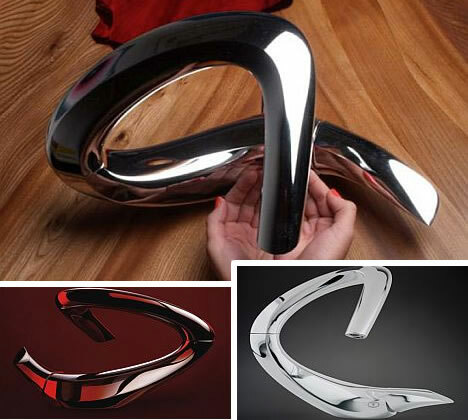 Looking more like a Samurai sword rather than a bathroom fixture, the softly curved from Graff is a masterpiece of plumbing that exudes elegance. Available in polished chrome and brushed nickel, the 3 feet tall wall mounted faucet adds enduring inspiration to your bathroom design and easily becomes the main focal point. Car enthusiasts can now go frugal with water, thanks to the new . Drawing inspiration from a car’s gearbox, the exquisite concept by Shen Di, regulates the amount of water that we use. Sleek, minimal, and following an ultra-luxurious theme, this futuristic copper finished design is a clever little idea for the green-minded. Can you imagine that some people come up with ideas to simplify the daily morning routine of teeth brushing? 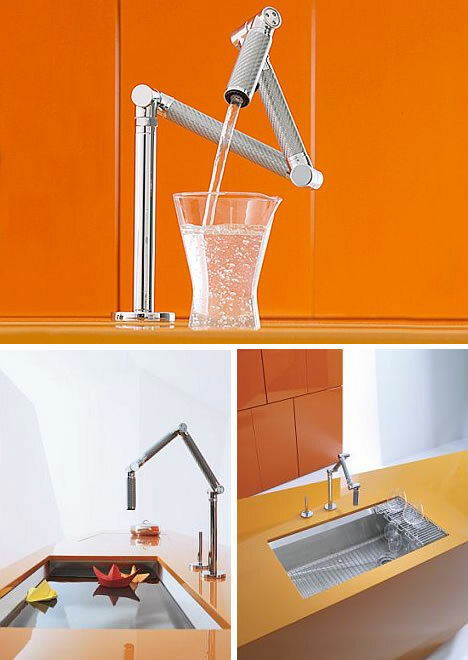 Dubbed the Tab and designed Jinsun Park & Byungmin Woo, this cool faucet looks like a cool water fountain, but the main feature is to keep cups away when you need to gargle. Less clutter thanks to a bit of over complexity is not a bad idea afterall, don’t you think? With its sculptural and artistic edges that betrays the clever engineering, this by Kholer is a cool addition to the functional kitchen of your dreams. 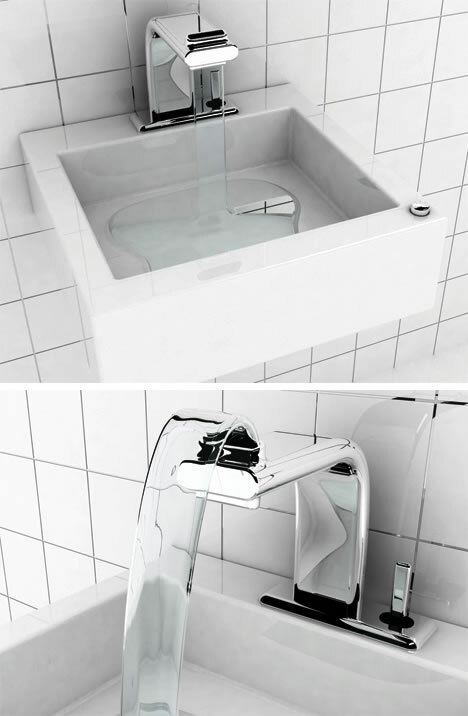 Designed for large spaces and to be used hands-free, you can pull it down into the sink when needed or you can tuck it away when not in use. 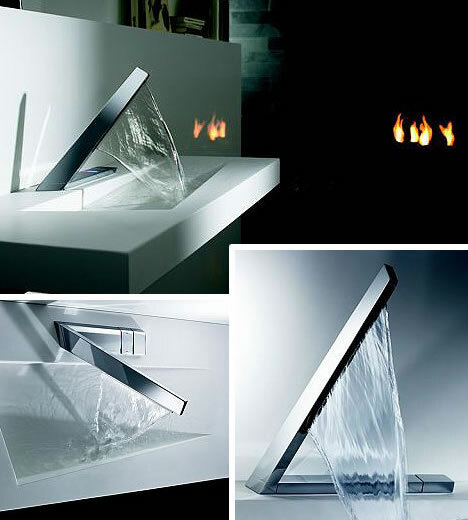 Adding a tinge of enjoyment to your daily routine, the expensive ($925+) Karbon Faucet certainly knows how to look practical. The Bola see-through faucet is a modern design created by Agustin Otegui, the see-through faucet proves fascinating with a practical purpose that does not fail to impress. Crafted with special lights that illuminate the falling water, the plan was to create something nothing short of breathtaking. 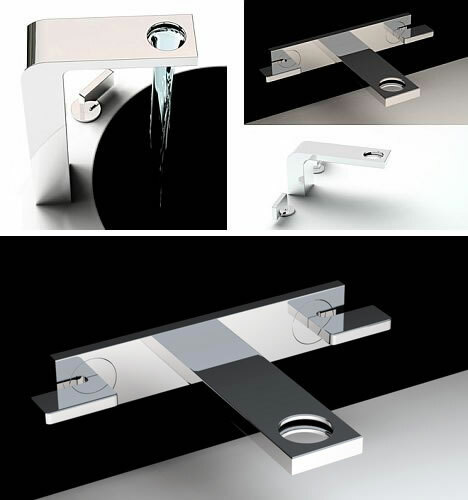 An amazing design exercise that looks clean,modern, yet simple, this hollow faucet looks perfect to take the burden away after a long day at the office. The Faucet Buddy is a fascinating gadget that you can attach to your current faucet in an attempt to monitor your water temperature as well as how much you have used. Designed by Baek Uyeol following a sleek theme, this particular add-on features a LED screen that not only makes it easy to read, but also makes the whole installment uber-cool. Perfect for the geek at home, eh? High end technology and sophisticated design combined, that’s what the SmartFaucet by iHouse is all about. Designed to recognize the user and immediately adjust the temperature to their commonly used preferences, it features brightly colored and attractive LED lights that change according to the preferred setting. 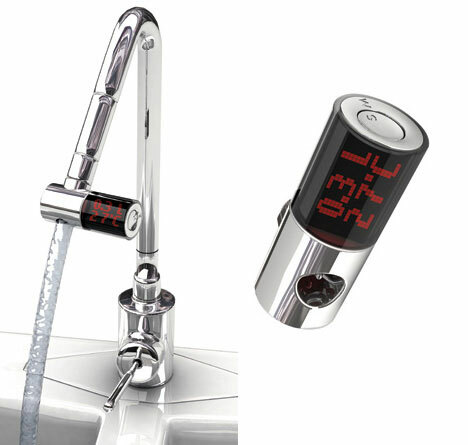 Capable of allowing you to check email or a calendar,the SmartFaucet more than high on technology. 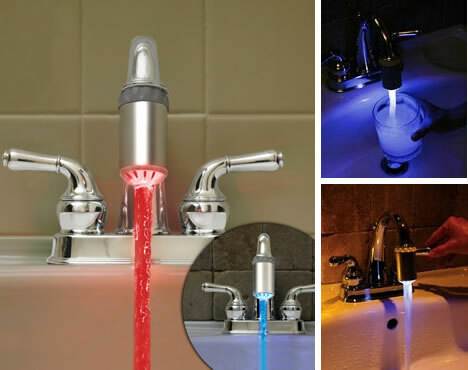 LED Faucet lights are amongst the most popular in faucet technology and make for some strange sink, basin and faucet designs. 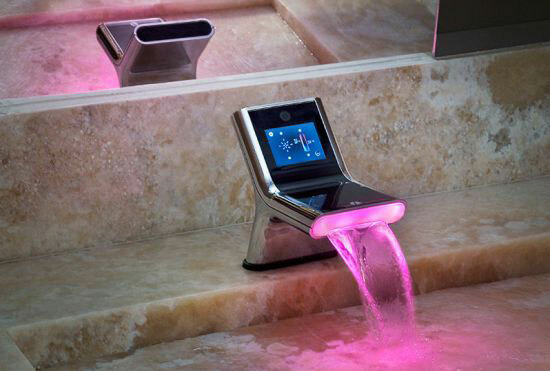 But if you don’t believe us, look at this amazing faucet designed by the wicked folks at . Meant for those that want to harness the fascinating power of an LED controlled temperature monitoring system, the lights change according to the water temperature, and are great as a safety measure. It’s weird to wash your hands with some blood-red water, eh? This article was written by Alex of Home Design Find. To learn more about home design trends, advice, and ideas please subscribe to our feed or email updates.